Comics Make Me Happy! : Will The Wonders Never Cease? Well, it's been kind of an insane week, with Thursday being the craziest of all. To quote Douglas Adams, "I never could get the hang of Thursdays." 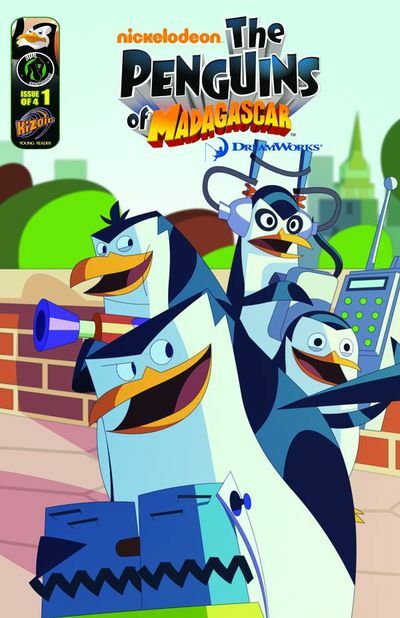 The only thing that could make this more awesomer is if in the comic the Skipper slaps another penguin and says, "Don't give me excuses! Get me results!" 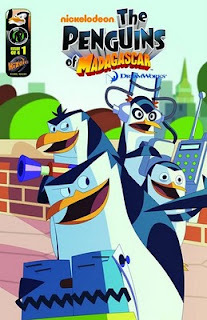 Yep, the penguins of Madagascar have their own comic miniseries. It's a good time to be alive. I'm still playing catch-up on my blog reading, and had cause to look you up. I went to my Idol-Head blog roll and... where the heck were you? So I fixed that. Anyway, this is an Adam Strange related comment. 1) Did you see he's getting the British import Lead Figurine & Magazine treatment in this month's Previews? "Did you see he's getting the British import Lead Figurine & Magazine treatment in this month's Previews?" Ahh!! Finally!! I've been checking the Eaglemoss website for months wondering when he'd be the next figure. Thanks for the heads up! Oh, and thanks for adding me to your blog list! Yeah, I've got to go back and find the Atom figurine I'm sure they've done, but I passed on pre-ordering. I only own the Martian Manhunter one, because they're too costly to buy regularly and come over on a rather slow boat. Plus, the paint jobs aren't always the best. Your guess is better than mine on the planet. It looks like drawings I've seen of Mars, but astronomy was never my bag. Are you sure they already made an Atom figurine? I just preordered one in April. They're only $14 at Big Bad Toy Store, cheaper than a DCUC figure. I honestly haven't looked close enough at the paint jobs on them because of all the warning stickers plastered all over the package which make me afraid to get within six feet of the thing lest I get lead poisoning. And they chose the classic costume for Adam Strange. Thank goodness.